↑ Hewitt, George (2004). 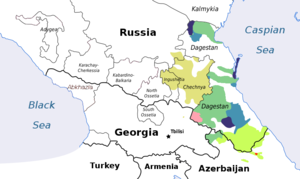 Introduction to the Study of the Languages of the Caucasus. Munich: Lincom Europaq. पृ॰ 49. ↑ Matthews, W.K. (1951). Languages of the U.S.S.R. New York: Russel & Russel. पृ॰ 88.